There is a Book Inside of You: Set it Free! Did you know you have a book inside of you? It’s true. We ALL do. But you are the ONLY person who can reach deep down in there and pull it out. 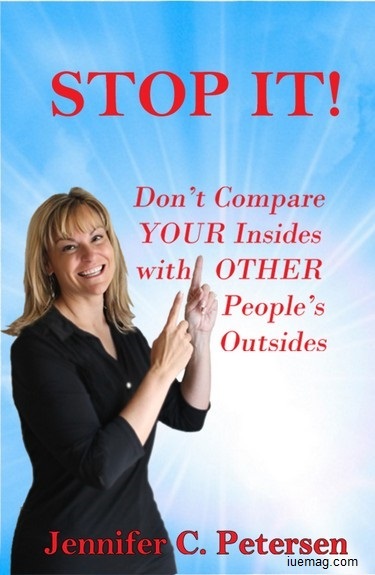 I had the opportunity to write and publish my first book named, “STOP IT! Don’t Compare Your Insides With Other People’s Outsides.” It’s been quite an adventure. I’d love to see more people take a leap of faith and also write a book. For many, it’s not about making money, it’s a simple hobby. Some write because it’s therapeutic, while for others, it’s their goal just to help one person. Think about what you know or what you’ve been through in your life: Your specialties; talents; insights, and imagination. They are unique to you and only you. Someone, somewhere out there can either learn or be entertained by what’s in your mind. It can be science fiction, action and adventure, romance, mystery, self-help, photo, art, children, travel, spirituality, cookbook, a how-to or anything your brilliant mind can come up with! If you’ve ever thought, “Wow, that would make a great book!” Then YES, you should write a book. If you have an idea, then write on it! Quit procrastinating. Writing is fun, challenging, entertaining, and there’s an incredible feeling you get when you write down that very last word in your book. It really is an accomplishment. As a first time author, I had many fears. I was worried about my writing skills, but that’s where an editor comes in. They will take care of all the proofing and editing. And I also thought no one would like my book and I’d have people write mean things about me on social media. Well, I had to come to the conclusion that there are 8 billion people in the world, and there are people who will like my writing, and people that will not like my writing. I can’t please everybody! The first thing I did was announce to everyone that I was an author and I had a book coming out. I committed to myself and all of my friends and strangers that I was really going to do this! I set up a Facebook page and other sources of social media and got a fan base started. Secondly, I listened to podcasts and read many articles on how to write and publish a book. Then, I got a piece of paper and brainstormed like crazy! I found something I knew a lot about and wrote down as much information about the subject as I could. I then broke all that information into groups, then chapters. Next, I got an editor that I listened to and respected. He talked me through what worked and did not work in the book. Once it was completed, I sent manuscripts out to a select group of close family members and friends for HONEST feedback. I made the changes I felt needed to be made. And finally, I set up a social media marketing plan to promote the book and scheduled a book signing/launch party. See how simple that was? If you’ve always wanted to write a book, what’s stopping you? Yes YOU can write your very own book. It doesn’t have to be long or fancy. Too many of us have had our story written by others. Isn’t it time we write our own? Jennifer C. Petersen is the author of, “STOP IT! Don’t Compare Your Insides With Other People’s Outsides.” She is the wife to Brent and the mom to 4 children. She’s an on-line Life Counselor and high demand keynote presenter. Her hot-topics are: Living a Balanced Life Emotionally, Physically, Spiritually & Financially; Parenting; and Becoming Your Best Self. Her degrees are in Drug & Alcohol Counseling & Human Services. Jennifer is a small business owner, loves to run ½ marathons, camping spending time with her family and living life to the fullest. Any facts, figures or references stated here are made by the author & don't reflect the endorsement of iU at all times unless otherwise drafted by official staff at iU. This article was first published here on 9th January 2016.